Americans are deeply confused over just about every aspect of smallpox, including the risks of vaccination, whether it can be treated and even whether people still catch it. A newly released survey found that a majority actually believes smallpox cases still occur in some parts of the world, even though the disease was eradicated 25 years ago in one of the greatest public health victories in history. "It's staggering," said Robert J. Blendon, who directed the survey at the Harvard School of Public Health. Eighty-seven percent believe they'd survive smallpox, "and, in fact, there really is no effective treatment when you really come down to it," he told CBS Radio News. Like several other recent surveys, this one found that about two-thirds of Americans say they would like to be vaccinated, though that willingness would plummet if people found their own doctors avoided the vaccine. The survey will be published in the Jan. 30 issue of the New England Journal of Medicine, along with several other reports on smallpox. The journal posted all of the smallpox papers on its Web site Thursday. President Bush's smallpox vaccination plan relied on predictions in a major study now being released in the journal, reports CBS News Correspondent Barry Bagnato. Three decades after the U.S. smallpox vaccination program was retired, it is to resume in January because of the risk that terrorists could introduce the disease, using virus stockpiled after person-to-person spread was eliminated. The vaccine will be mandatory for about 500,000 military personnel and recommended for another half-million who work in emergency rooms and on special smallpox response teams. The government will make the vaccine available to anyone else who wants it beginning late next spring or early summer, though it will not encourage ordinary people to get the shots. The government's policy of targeting doctors and nurses is supported by a detailed analysis in the journal, sponsored by the RAND Center for Domestic and International Health Security, that examines various scenarios of smallpox release. "We show there would be a net benefit to vaccinating health workers, even if there is a low probability of an attack, because health workers are at greatly increased risk," said the study's director, Dr. Samuel Bozzette of the Veterans Affairs San Diego Healthcare System. "These are people who are eight to 20 times more likely than the public to become infected with smallpox," he told CBS Radio News. Blendon's survey was based on calls to 1,006 randomly selected adults over the past two months. It carried a sampling error of plus or minus 3 percentage points. 30 percent believe there has been a smallpox case in the United States in the past five years, and 63 percent think there has been one somewhere in the world. Actually the last U.S. case was in 1949 and the last in the world was in 1977. 25 percent said it was likely they would die from the vaccine. The actual death rate from the shots is estimated to be less than three per million. 78 percent said they thought medical treatment for smallpox would prevent death or serious illness. Actually, there is no proven treatment after symptoms start. 16 percent think the country has enough vaccine to give everyone in case of a smallpox attack. The government says it has enough for all. 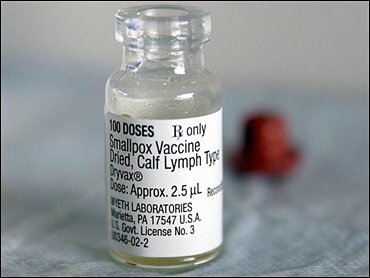 58 percent do not believe that vaccination within a few days of exposure will prevent people from contracting smallpox. Actually, it will. The Centers for Disease Control and Prevention has largely focused on educating doctors about smallpox, assuming they will then communicate with patients. "If and when a licensed vaccine is made available to the general public, the plan here is to embark on a mass-media education campaign that could include posters, advertisements and public service announcements," said CDC spokesman Tom Skinner. The possibility of rare but potentially serious side effects is the main drawback of widespread smallpox vaccination. The Bush administration estimates that one to two people per million would die from the shots. After reviewing about 14,000 medical articles going back 100 years, Buzzette's team chose a somewhat higher estimate of about 2.7 deaths per million. If 60 percent of the 290 million Americans were vaccinated, that would mean nearly 500 deaths, even if smallpox never reappears. However, in any outbreak, health care workers are the ones most likely to catch the virus. They make up 3 percent of the population but would account for 20 percent to 60 percent of all smallpox cases, depending on which scenario of disease spread is used. Smallpox could be spread by terrorists in various ways. One scenario would be to let three smallpox-infected terrorists ride mass transit in a large city. The researchers estimated that fewer than 20 people would die before the disease was contained through a vaccination campaign. However, nearly 500 people would die if only 60 percent of the population gets vaccinated, leading Bozzette to conclude "vaccination of the public causes more harm than good." The worst scenario imagined was turning 40 terrorists loose on a busy day in 10 large airports with portable nebulizers spraying smallpox into the air. Unless most of the population had already been vaccinated, between about 40,000 and 55,000 people would die.